"This tablet marks the site of the first settlement in O'Brien County made by Hannibal H. Waterman, wife and child in July, 1856. The first fort, first town, and county seat, "Old O'Brien" was located on this homestead. Anna Waterman was the first white child born in the county, 1857. The indians stopped here on their way to the Spirit Lake Massacre in 1857. Erected by the Daughters of the American Revolution of O'Brien County." 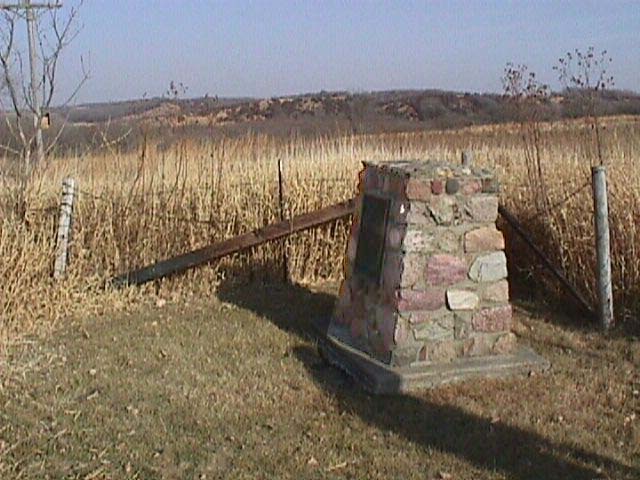 This marker overlooks the valley of the Little Sioux River. Behind the marker is a 400 acre nature preserve which also encloses the small, historical Waterman Cemetary. Hunting, hiking, snow activities are all allowed in the preserve. Assembled by ovk. Last updated 12/30/1999.